The Big Wobble: Our Sun eats a comet for breakfast! 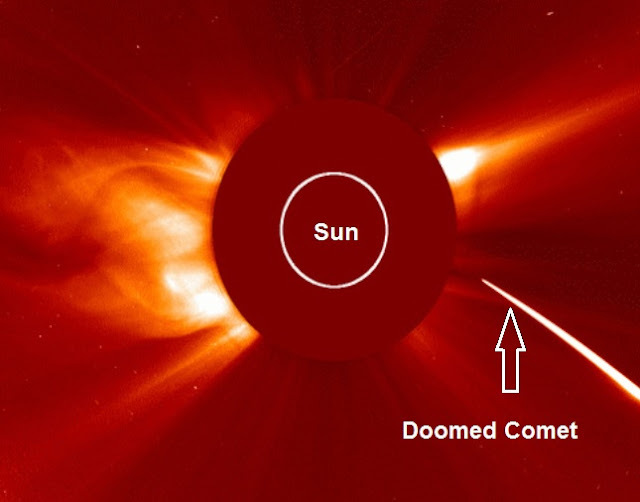 COMPLETE DESTRUCTION OF A COMET: Yesterday, Aug. 4th, a comet dove into the sun. It did not come back out again. SOHO (the Solar and Heliospheric Observatory) witnessed the disappearance: "That was the total destruction of a 600 km/s snowball, witnessed exclusively by SOHO," says Karl Battams of the Naval Research Lab in Washington DC. "My good friend and colleague Matthew Knight estimated the comet peaked at ~mag -0.5, putting it squarely in the top ten (five?) of SOHO's brightest Kreutz sungrazers." Kreutz sungrazers are fragments from the breakup of a single giant comet many centuries ago. They get their name from 19th century German astronomer Heinrich Kreutz, who studied them in detail. Kreutz fragments pass by the sun and disintegrate almost every day. No wonder there's a massive coronal hole on the sun now !! !